A smile is one of the first things people notice about you. Smiles can be infectious and improve someone’s day. Smiling can release neuropeptides that decrease your stress levels. And smiling can even lengthen your life span. A lovely smile can make us appear more attractive to others. Both men and women report that a smile is one of the first things they notice about a prospective partner. And teeth are an important part of that equation. Research from a Kelton study shows the importance of good teeth. Those surveyed said that they view people with straight teeth as smarter, more successful, and even likely to date more often. That’s a lot to infer from a set of choppers. Sure, people buying horses always check their teeth. But potential dating partners? So how confident are you about your smile, your teeth, and your overall dental hygiene habits? As we enter a new year, one of the most important resolutions you can make is to take better care of your teeth and gums. Why? Because good dental hygiene is important to your overall health. Tooth loss and eventual kidney disease? The mouth is an important part of our immune system. So, for your health’s sake, here are 10 dental resolutions you should consider for 2017. Brush at least two times each day. If you’re very disciplined, it’s great to brush after every meal. You can easily take a toothbrush to your office or school. Brush each time for at least two minutes, using an up and down motion, to properly remove plaque, decay, and gum disease. Like the story of Goldilocks and the Bear, you should always brush with just the right amount of pressure: not too soft; not too hard. Harder is not better when it comes to your gums. That’s why we recommend using an electric toothbrush. Their high-powered bristles get rid of plaque much more easily than you can accomplish by brushing manually. Electric toothbrushes are also aces at accessing hard to reach places in your mouth. Need more incentive to brush your teeth? Here are 25 additional reasons. Not only does sugar boost inflammatory responses in your body, it also increases your chances for tooth decay. The moment you ingest carbohydrates and sugars, the bacteria in your mouth converts them to acid. And it’s that acid that attacks the enamel on your teeth. As part of your health and fitness resolutions, make wise food choices in 2017. Of course, you can have an occasional sweet treat. But try to make healthier snack choices like reaching for crunchy fruits, nuts, and cheeses. Replace sugary soda pop for milk or water. 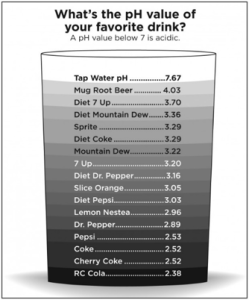 Remember: The higher the pH, the better the liquid is for your teeth. Here’s a great chart showing the acidic levels of all types of drinks. Fruits and vegetables clean plaque from teeth, freshen breath, and help fight bacteria. Dairy products are high in calcium, which help to keep your teeth strong. Whole grains contain complex carbs that are high in fiber. Whole grains help prevent tooth loss as well as receding gums. Lean proteins, like chicken, will help strengthen your tooth enamel. Everyone knows that smoking is bad for your health, but did you know that smoking doubles your risk for gum disease? Chewing tobacco, like smoking, can lead to mouth and throat cancer, tooth decay, and receding gums. Enroll in a smoking cessation class, try nicotine patches or gum, and/or find a healthy replacement like exercise to replace the cravings. Make 2017 the year you rid your body of tar and nicotine. Moderate alcohol consumption is defined as having up to one drink per day for women and up to two drinks per day for men, according to the Dietary Guidelines for Americans. If you can safely stay within those parameters, you should be fine. And drinking moderately does provide some health benefits, including a lowered risk for cardiovascular disease. However, excessive alcohol use can increase gum recession. Take it easy on the booze and your mouth will thank you. Make a commitment in 2017 to floss at least once each day. Only flossing can remove plaque between teeth and below the gum line. Take your time and really attack the bacterial matrix by flossing down and then to each side of your teeth. Stop decay before it leads to gum disease. Toss your toothbrush four times a year. At Uptown Dental, we recommend replacing your toothbrush every three months. With each use, the bristles on your brush become frayed. The more they’ve been used, the less effective they become. Children may need to have their toothbrushes replaced more frequently. The American Dental Association (ADA) recommends regular dental visits. At Uptown Dental, we believe a visit every six months works for most people. By having regular cleanings, x-rays, and exams, we can make sure we catch and treat any dental issues you may be having. If you have serious dental issues, we may recommend more frequent visits. Even if you have healthy teeth and gums, Uptown Dental can improve your look. Consider our many cosmetic procedures, including teeth whitening, bite corrections, and straightening crooked teeth. Ask about these options at your next visit. The ideal way to preserve your smile and take care of your oral health is to treat dental needs as soon as they arise. If you’ve been putting off cavity fillings, bonds, crowns, implants, or other restorative work, make 2017 the year you put your dental health first. Call us or schedule your appointment today. Trust Uptown Dental with your smile. Our friendly and professional staff is here to listen and here to help. We look forward to seeing you in 2017.